I brag that if the apocalypse were to hit us anytime soon, everyone would come knocking on my door because I’d be able to catch them fish for food. I’m a liar and I stink at fishing, but it is a great joke. This Indonesian teenager put his money where his mouth is and survived 49 (!!) days stranded at sea by catching and cooking fish. What a legend. Aldi Novel Adilang, 19, manned a floating fish trap 80 miles off the coast of Indonesia’s North Sulawesi. The trap was anchored to a hut, but loose ropes and intense winds caused him to detach from the hut in July and sent him floating into the Pacific Ocean, all alone. What would you do in that situation? Attempt to swim back? Spell SOS on the roof? Befriend a volleyball named Wilson? Aldi Novel Adilang decided to be awesome at fishing, and use those skills to help him survive. 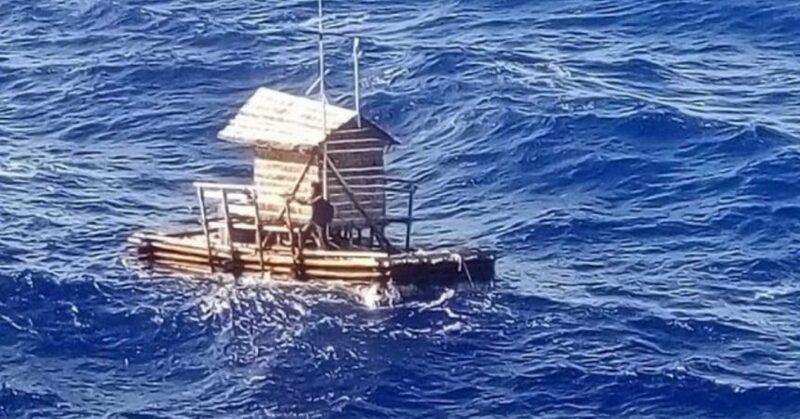 He caught and cooked his own fish right there on his stranded hut until FINALLY he was rescued after 49 days lost at sea. Keep fishing. Never stop. It might save your life one day.